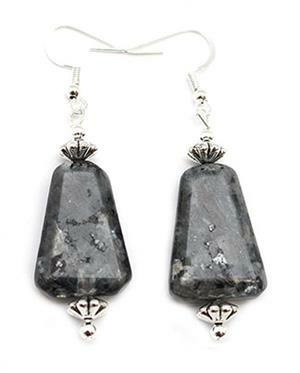 The stone used on these dangle earrings is black labradorite and has silver plated beads top and bottom with silver plated ear wires. It measures approximately 2 1/2" long including wires by 3/4" wide at widest. It is Navajo hand crafted by Sandra Francisco. Color shade of stone will vary but shapes are pretty much the same.